"She said, 'I want to give Aiden my hair.'" 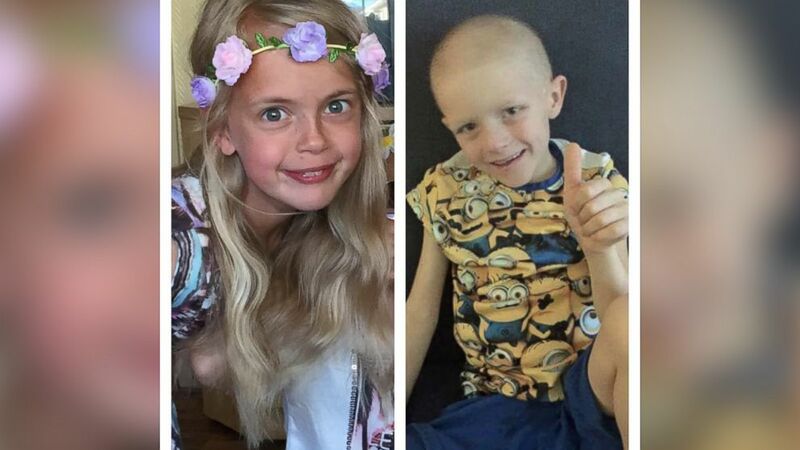 camera (Charlie Spiers ) Libby Tucker-Spiers cut her long locks off for her best friend Aiden, who is battling cancer. 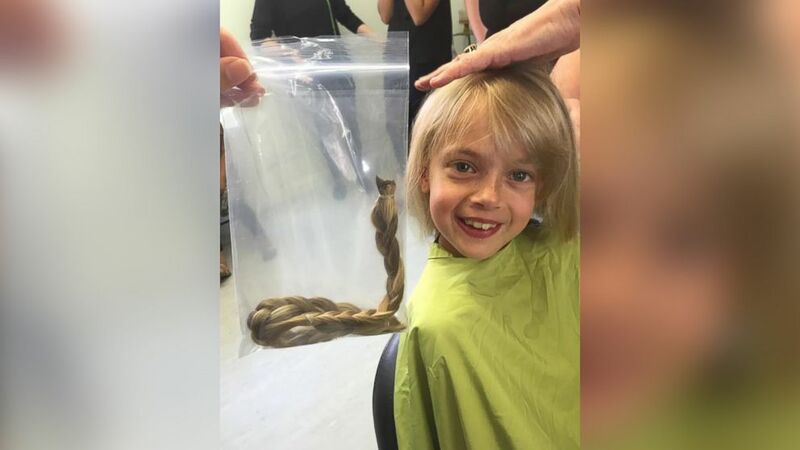 Libby Tucker-Spiers' mom said her daughter's dream has always been to look exactly like Rapunzel -- but after seeing the side effects that chemotherapy had on her best friend, Aiden Selleck, she didn't think twice about chopping off her flowing blonde hair just for him. “I'm so proud of her," Charlie Spiers of England told ABC News. "She's got so much going on herself with her own learning difficulties. She's just selfless. She's an amazing little girl, but Aiden is just as amazing. He's so brave." Spiers, a mom of four, said Libby, 9, and Aiden, 7, have been friends for most of their young lives. (Charlie Spiers ) Libby tells her family that Aiden is her "boyfriend." "They say they're boyfriend and girlfriend," Spiers said, laughing. "On Valentine's Day they got each other cards and everything." "Me and Clare [Aiden's mother] we were induced together in the same room," she added. "Aiden's brother and Libby's sister were born on the same day and that’s how we met." While the two families have made great memories together, Spiers said it was on April 28 when the Sellecks received some devastating news of Aiden's health. "He has Wilms' tumor, which is kidney cancer," she said. "It happened really quick." 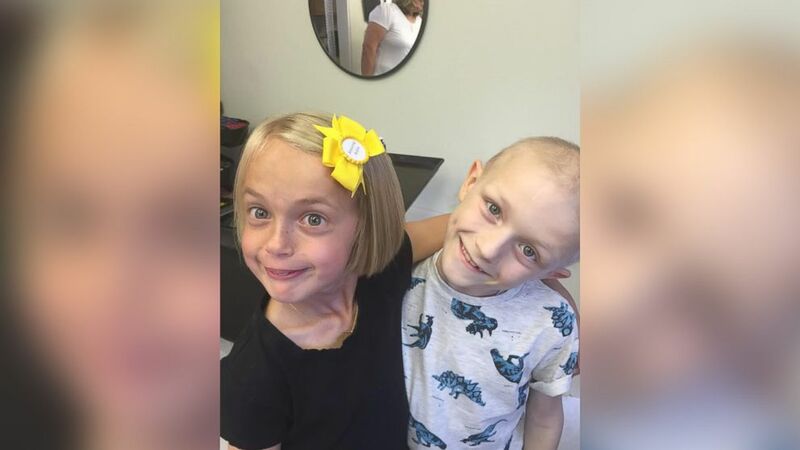 Following his third round of chemotherapy, Spiers said Libby, who has global development delays, stopped to see Aiden in the hospital while on her way to her own checkup. "It’s a sad one. Aiden was in bed because he had a temperature. She saw him on the bed and he was pale -- white as a ghost. I think it shocked her because he didn't have any hair. The last time she saw him he had curly, blonde hair." (Charlie Spiers ) Libby and her family will donate the hair to Little Princess Trust in England. Upon leaving the ward, Spiers said Libby decided on her own that she wanted to donate her hair to Aiden. "She said, 'I want to give Aiden my hair,'" Spiers recalled. "I said, 'You can't.' and she said, 'But I want to, I miss his lovely hair." 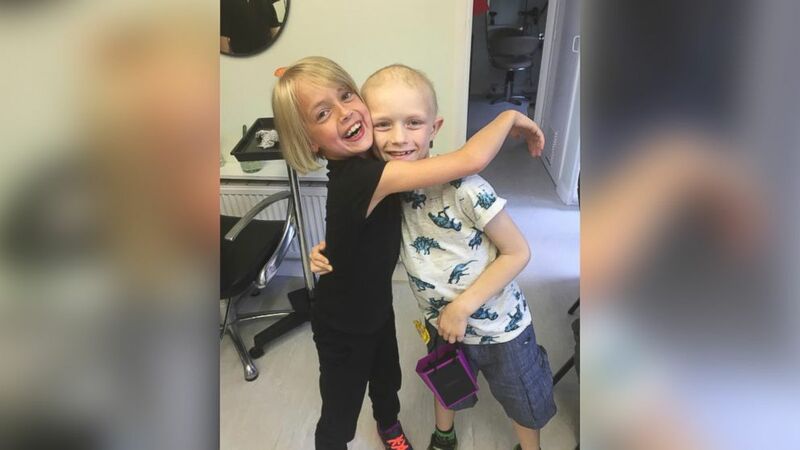 Aware that Aiden didn't want to wear a wig, Spiers said she introduced Libby to the "Little Princess Trust" website, where for about £350 ($540 U.S. dollars) and a hair donation, a wig can be made for a little boy or girl. On July 21, Spiers said she and the Sellecks took Libby to a salon where 11 inches was cut from her hair. Clare Selleck said witnessing Libby's selfless act was an amazing moment for both families to see. "He [Aiden] just kept looking at her saying, 'Oh Libby, are you OK? It's going to be short!,” Selleck said. "I think it's amazing. She obviously didn’t have to do that and it's lovely that she wanted to. She had these beautiful Rapunzel locks. "She's been a really great friend and a really brave girl to cut off all that hair for him," she added. "She looks beautiful." (Charlie Spiers ) Aiden Selleck was diagnosed with cancer in April 2015. After the haircut, Selleck said Libby began fundraising for the wig, as well as a "End of Chemo" party for Aiden, through local businesses and their Libby's Locks for Aiden site. "Being a boy, Aiden said 'I don't want your hair,' but it was really the idea behind the fundraising," Selleck said. "The money that we raise will go to the party and back to the charities that have helped us as well." "He has 27 rounds [of chemo]," she added. "Our last chemo will be the 30th of December, so we’ll finish this awful year and look to the new year cancer-free. When you have a child with cancer you tend to live day by day. It’ll be nice not to have that worry about cancer, but to plan things and have a little more normality back into our lives." Selleck said Aiden hopes to have his "End of Chemo" party at a local stadium with family, classmates and soccer friends, following his final treatment.